» Articles » Health » Butternut Squash: Better Not Squawk About This Good Gourd! Butternut Squash: Better Not Squawk About This Good Gourd! What’s that funny looking thing in the garden? Is it a vegetable, a gourd, or a deformed pumpkin? Actually, it’s butternut squash, a power food disguised as a mild-mannered veggie! Beware of butternut squash, my friends; these are sneaky little rascals who like nothing better than lounging about in your vegetable garden in an unassuming manner, acting like they are no better than any other lowly food fare, quietly clinging to their creeping, crawling, climbing little vines. Don’t fall for their act! These guys are monsters of nutrition whose bite is much more powerful than their bark. (right here, of course, I should say “skin” rather than “bark” but I just couldn’t resist that little “bite/bark” wordplay; thanks for your indulgence!). And what’s in their bite, anyway, that’s so all-fired high and mighty? Vitamins A, C, and B6, that’s what! And potassium, too. And they’re a good source of fiber in your diet and, and, and. . . . . Okay, here’s the biggie—butternut squash is another one of those “pale on the outside, bright orange on the inside” power foods that contains beta carotene, which helps to lower your risk of heart disease! See, I told you not to trust ‘em! These guys are in the Cucurbitaceae family, the same bunch that claims pumpkins, watermelons, gourds, cucumbers, and lots of other plain-lookin’, sneakin’ up on you and makin’you healthy packs-a-punch power foods! Why, we ought to just skin ‘em and toss ‘em into boiling hot water; that would teach ‘em a thing or three! But, no, I’ve got a better idea. Let’s just split ‘em open right down the middle, take out the seeds, and bake ‘em in the oven or the microwave in a covered glass dish. Then, we’ll add some butter and seasoning and eat ‘em up. That’ll serve ‘em right! Butternut squash is easy to grow in your home garden. Start plants from seeds indoors or seed directly into the soil after danger of frost has past. Give the plants plenty of sunshine and water in order for them to develop good full squashes. The vines will grow from 10 to 12 feet in length and each vine should produce several squashes. Allow the vines to die back before you harvest your butternut squash in the late summer. This will assure maximum size and full development of nutrients within the ripe squash. The stems of the mature, pale-yellow vegetables will be dry, tough, and brown. The exterior surface of butternut squash is firm to the touch, which is characteristic of the winter squashes and unlike the soft exteriors of the summer squashes. The harvested crop can be stored for several months if kept in a cool location. 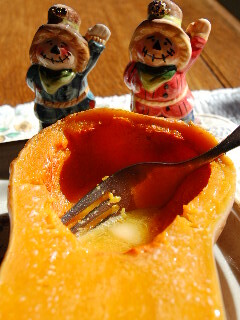 The inside edible pulp of butternut squash is a beautiful deep orange color (hello, beta carotene!). In the raw state, the pulp is hard and crunchy, much like the inner flesh of pumpkin, but becomes soft and smooth after baking achieving a texture much like that of a baked potato. 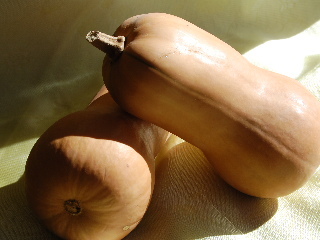 Butternut squash is a tasty and nutritious food, often used in soups, pies, and breads. In its simplest form it makes a great side dish, baked and eaten like sweet potato. Don’t let butternut squash fool you; it may be funny looking on the outside but it’s a powerhouse on the inside, just waiting to sneak up on you and make you healthy!